At Regan McEntee and Partners we have been handling personal injury claims* on behalf of a wide range of clients for over 50 years. We are experienced and skilled in handling claims in relation to road traffic accidents, accidents at work and other cases where people have suffered personal injuries* that were not their own fault. 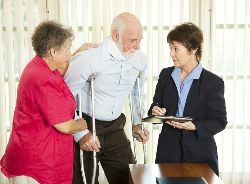 All personal injuries claims* must be submitted to the Injuries Board in the first place. This is a very important process which can decide the outcome of your claim and you only get one chance. We will work with you to ensure that you understand exactly what is involved and that everything that is of concern to you and should be included has been covered in bringing your claim. Most cases that are accepted by the Injuries Board for assessment are settled without any Court proceedings and therefore, it is vitally important for you that this process is completed thoroughly and correctly. If the claim is not accepted by the Injuries Board for assessment, or if the assessment made by the Injuries Board does not reflect the true value of your claim, Court proceedings will be required. If this becomes necessary, it is vitally important to ensure that you have had the appropriate legal advice from the outset to ensure that these Court proceedings have a successful outcome. If appropriate action is not taken immediately after the accident has happened, vital evidence may be lost that may later be required to prove your claim if Court proceedings become necessary. Peter Higgins and Ronan Regan specialise in this area.